With smaller pneumatic wheels being more prone to punctures and loss of air pressure, the concept of filling the tyre with microcellular polyurethane (MCP) has become very popular. The hardness of the foam filling is designed to imitate a pnuematic wheel of equivalent size when inflated to it’s recommended pressure. 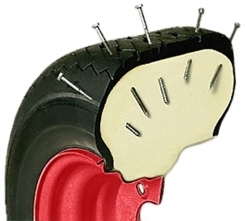 Penetration by nails or other sharp objects does not affect the performance of the wheel. When left fully loaded a flat spot may form for a short period of time but the foam has a memory and will recover to its original shape in a short time. Foam filled wheels are not designed for high speed use.